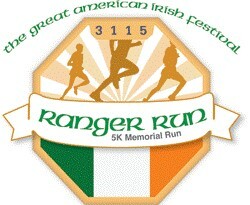 Join us for the 12th annual RANGER RUN 5K at the Great American Irish Festival! Come for the race…and stay for the music! Join us this year at a new time: 8:30 a.m. on Sunday, July 28th at the Herkimer County Fairgrounds. You’ll actually be running 3.115 miles (instead of the 3.1 mile 5K that you’re used to!). Wait, what!? You want me to run further than an actual 5K?! YES! That is because this race is dedicated to Trooper Tim Sullivan who passed away in 2007 while out on a run. Tim’s shield number was 3115, and this race length honors him with an extra 0.015 miles. You’ll be joined by hundreds of runners, many of whom are donning their best Irish running gear (green wigs count as running gear, right?!) and competing for the coveted “Best Irish Outfit” prize. You can expect the return of your favorite elements of the Ranger Run: Bagpipes to send you on your way at the start, heartbreak hill to bring you to the finish, and of course…FREE ENTRY TO THE FESTIVAL ON SUNDAY WHEN YOU SHOW YOUR BIB AT THE GATE! KIDS: Join us for the 2nd Annual “Ranger Kids 1/2 Mile Run”! This un-timed race will go off at 8:00 am and is FREE for all children under 12. This race is un-timed and t-shirts are not included with registration (but may be purchased for $10).